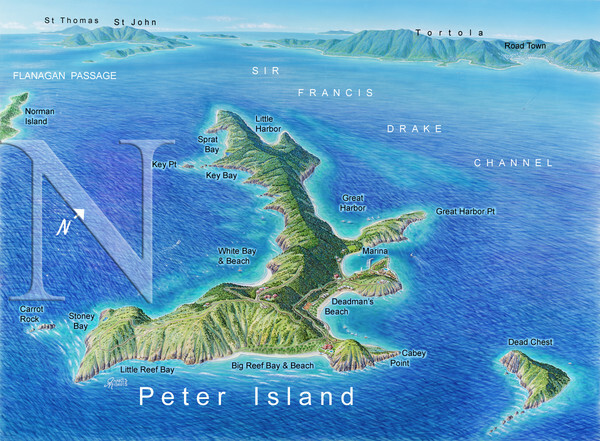 Peter Island is the largest private island in the BVI and the fifth largest of the 60 islands, quays, and exposed reefs that comprise the BVI. It was owned by the Amway Corporation from 1978 until 2001 when full ownership was transferred to the Van Andel family, co-owners of Amway. The island is predominately undeveloped but contains hiking and biking trails on which to discover the tropical flora and fauna indigenous to Peter Island. The beaches face the Atlantic Ocean, the Caribbean Sea, and the Sir Francis Drake Channel. The only hotel, the 52-room Peter Island Resort, is ranked in Conde Nast Traveler’s “Gold List".